Planning a ‘daycation’ to soak away your worries? With this list you’ll pay less than half of what you’d have to cough up for a five-star night. Price: Dhs200 minimum spend on weekdays, Dhs300 minimum spend on weekends. The brand-new hotspot is set to be the place to be this summer. 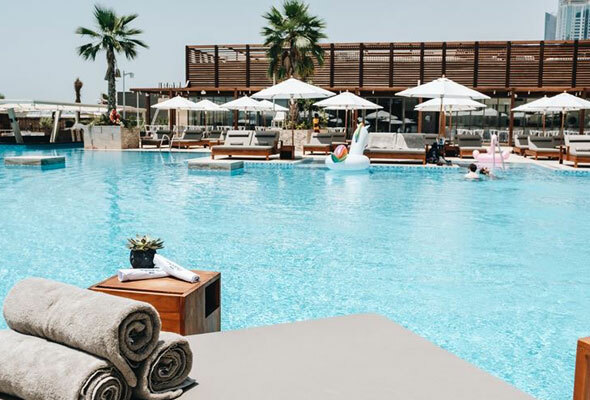 With rows of sun beds and pools spread across multiple levels, the main pool of W Dubai – The Palm is your go-to spot for working on your tan. There’s uninterrupted views of Dubai Marina from your lounger and water sports for the more adventurous daycationers. Luxury egg-shaped cabanas provide a haven to soak up the sun and relax for the day. There’s a ladies’ day on Sundays where boys are also welcome, the price includes free flowing drinks and a selection of bites for Dhs150 for ladies and Dhs250 for guys. 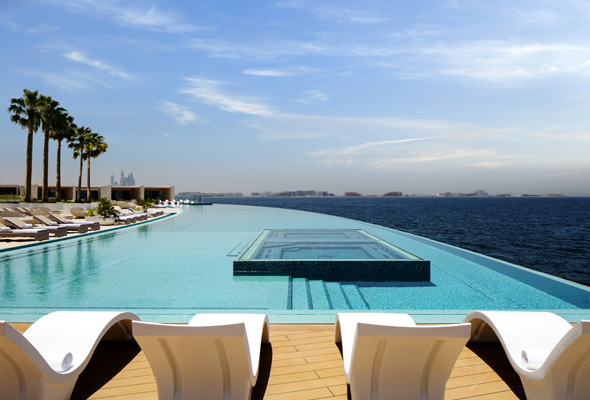 The transparent pool sits on the 16th floor of the FIVE Palm Jumeirah. As well as some pretty impressive views across JBR and out to the Arabian gulf, the glass-walled swimming pool is perfect for snapping a selfie against with the Marina skyline in the background. 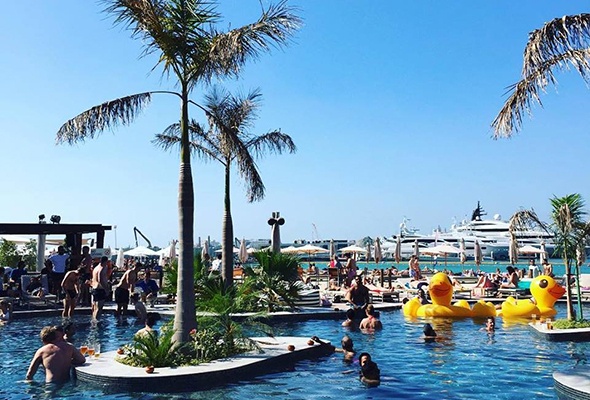 It’s Dhs200 for pool access with Dhs100 in food and drink included, or head down to the Candypants ladies’ day on a Saturday, where prices for five hours of unlimited drinks start from Dhs149 for girls. 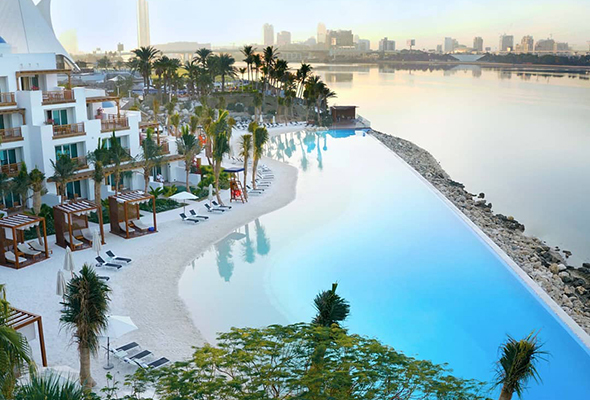 The Lagoon opened earlier this year, offering a much-needed spot of calm in the midst of Dubai Creek. The pool, described as an ‘oasis of tranquility’, is nestled in the Park Hyatt Dubai and has a 100-metre ‘infinity lagoon’ with private sandy shore. Enjoy 180 degree views of the creek and Dubai’s iconic skyline while relaxing on a daybed or private gazebo. Perfect for: Bathing under the Burj Al Arab. Price: Dhs200 on weekdays, Dhs375 on weekends. 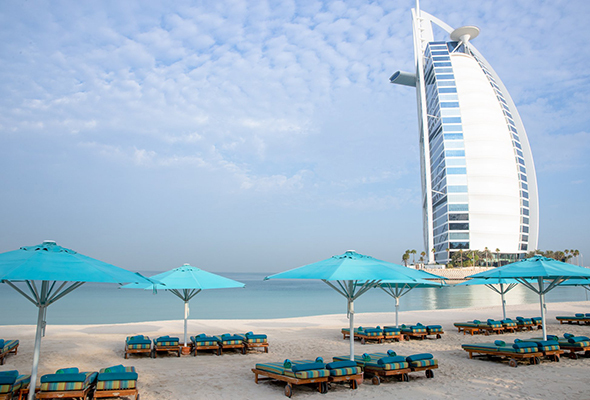 At Summersalt, you can lounge by the pool or hang out at one of Dubai’s most pristine and exclusive beaches, and the beach club’s offers one of the best views of the Burj Al Arab which can be beat only if you get on a boat. It is quite literally under the shadow of the Burj (don’t worry though, it won’t stop your tan game). There’s also a ladies day offer on Mondays, pay just Dhs100 and receive a sun lounger and complimentary cocktail. Plus every day you can redeem 25 per cent of the food and beverage menu. Price: Dhs250 on weekdays, Dhs300 on weekends. Located in the swanky One&Only Royal Mirage, DRIFT is described as a destination where “luxury beach chic meets casual simplicity”. There’s an infinity pool, 1 kilometre of prime beachfront real estate, and a restaurant and bar serving up Provençal cuisine and interesting cocktails. On Monday and Tuesday, ladies can enjoy a sun lounger and complimentary cocktail for Dhs125. DRIFT Beach Dubai, One&Only Royal Mirage, Al Sufouh, 10.30am to 7pm, daily, Dhs250 weekdays, Dhs300 weekends. Tel: (04) 315 2200. driftbeachdubai.com. Perfect for: A relaxed Marina day-cay. Price: Dhs300 weekdays (with a Dhs100 food and drink voucher), Dhs400 weekends (with a Dhs200 food and drink voucher). If a swan float is an essential prop to your swimming pool session then Azure Beach at the Rixos Premium is the one for you. 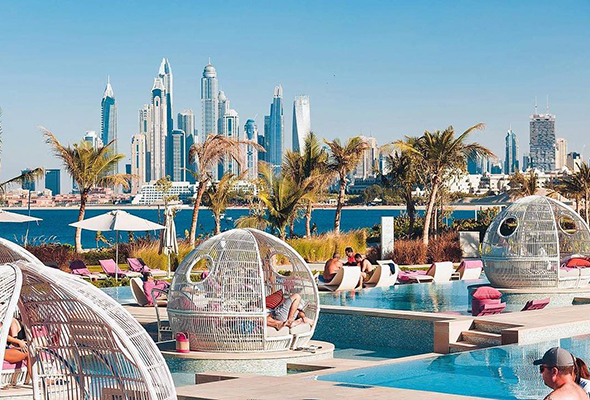 Climb aboard an inflatable toy in the well-sized infinity pool, or soak up the views from the comfort of your sun bed, with Ain Dubai providing an Insta-worthy backdrop. 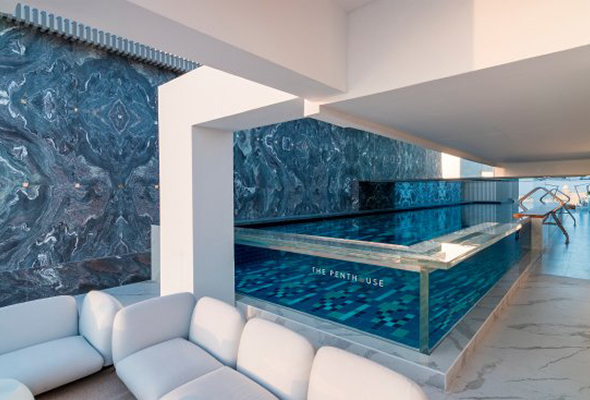 When the heat gets too much, you can retreat into the poolside lounge. Rixos Premium, JBR, 10am to late, daily, Dhs300 weekdays with a Dhs100 food and drink voucher, Dhs400 weekends with a Dhs200 food and drink voucher. Tel: (052) 777 9472. azure-beach.com. Price: Dhs170 per person (with a Dhs100 food and drink voucher), Dhs320 per couple (with a Dhs200 food and drink voucher). 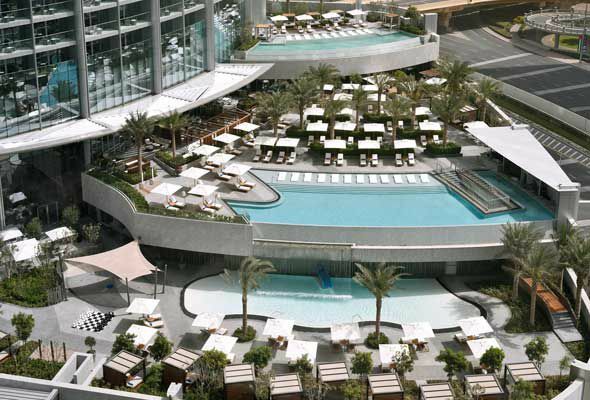 This urban landscaped pool area sits on the rooftop of Sofitel Dubai Downtown. The infinity pool has some great views out across downtown Dubai, and stretches across the length of the rooftop terrace. Summer prices start from Dhs170, includes a Dhs100 food and drink voucher. Price: Dhs100 on weekdays (includes one welcome drink), Dhs150 on weekends (includes one welcome drink). This Palm Jumeriah beach club isn’t the easiest to find, but it’s worth it when you get there. There’s a large pool that opens out with views onto the Palm, and a large patch of white sandy beach for those who prefer the ocean to the pool. It’s family-friendly, with a poolside beach bar and lounge, and children’s pool for the little ones. Building 8, The Shoreline, Palm Jumeirah, 7am to 12am, daily, Dhs100 weekdays including one drink, Dhs150 weekends including one drink. Tel: (04) 430 9466. riva-beach.com. Perfect for: Parting all day and night. Price: Dhs160 weekdays, brunch prices on weekends. Zero Gravity is one of the best for a party crowd: it’s the go-to spot for residents and tourists looking for a lively atmosphere, and the pool itself is huge. There aren’t many single loungers by the pool, but cabanas are available on a first come first serve basis. Throughout summer, a weekday pass costs Dhs160 per person with a Dhs50 voucher back to spend on food and drink. On the weekends, there’s a four-hour Friday brunch package priced at Dhs295 for ladies and Dhs345 for guys, and a five-hour Saturday package priced at Dhs249 for ladies and Dhs299 for guys. Zero Gravity, Dubai Marina, 10am on weekdays, 8am on weekends, Dhs160 weekdays with a Dhs50 food and drink voucher, brunch prices on weekends. Tel: (04) 399 0009. 0-gravity.ae. Perfect for: Upping your ‘gram game. At the Intercontinental Dubai Festival City, there are two passes on offer to their expansive infinity pool which overlooks the city. A standard day pass entry will set you back Dhs150 or there’s a day pass priced at Dhs350 offers you pool access, a Dhs100 voucher redeemable at the spa and a complimentary lunch at The Pool Bar. Big, brash and boisterous, Barasti is a Brit expat favourite, and quickly packs out with people. The giant top deck screens football and rugby, live bands perform at sunset, and there’s a daily happy hour from 4pm to 7pm. Plus, their pool is the perfect place to cool off, and stays open until late each night. Perfect for: A luxury day by the beach. Price: Dhs250 weekdays, Dhs300 weekends. 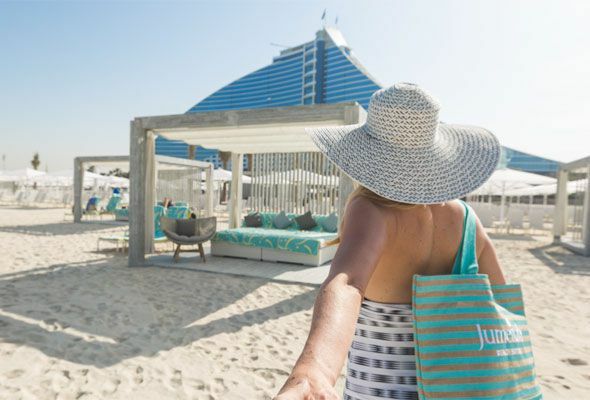 The beachfront at the Jumeirah Beach Hotel has undergone a refurb, and the gleaming white sands facing out towards the Burj Khalifa are now laid with rows of bright white loungers, cushy cabanas and even a beach bar. The service is second to none, and you can order a host of mocktails and cocktails to your bed while you soak up the sun. The beach pass also comes with access to the pool, discounts on the outdoor spa treatments and water sports activities. Jumeirah Beach Hotel, Jumeirah, open daily, Dhs250 weekdays, Dhs300 weekends. Tel: (04) 406 8800. jumeirah.com. Perfect for: Catching a tan at a posh address. Price: Dhs150 weekdays (with a Dhs75 food and drink voucher), Dhs200 weekends (pool access only). The Burj Club at Dubai’s iconic Burj Khalifa is a great spot in the centre of downtown for catching a tan. Looking out across the fountains, access to the indoor and outdoor pools is priced at Dhs150 through the week, inclusive of a Dhs75 voucher, that can be used against food and beverages at Rooftop, The Burj Club and Dhs200 on weekends for pool access only. The Rooftop Pool, The Burj Club, Burj Khalifa, Downtown Dubai, daily 9am to 8pm, Dhs150 weekdays, Dhs200 weekends. Tel: (04) 888 3900. burjkhalifa.ae. Perfect for: Feeling like you’re on a resort vacay. Price: Dhs270 for adults, Dhs105 for children age 3 to 15. Anantara on The Palm has three huge lagoon pools that wrap around the rooms, as well as an oceanfront, 50-metre infinity pool. It’s a luxe spot that makes you feel like you’re on a Maldives-style vacation. Perfect for: A pool day with great atmosphere. Price: Dhs150 weekdays (with a Dhs100 food and drink voucher), Dhs300 weekends (with a Dhs250 food and drink voucher). This globally renowned beach club has built its reputation for good reason. 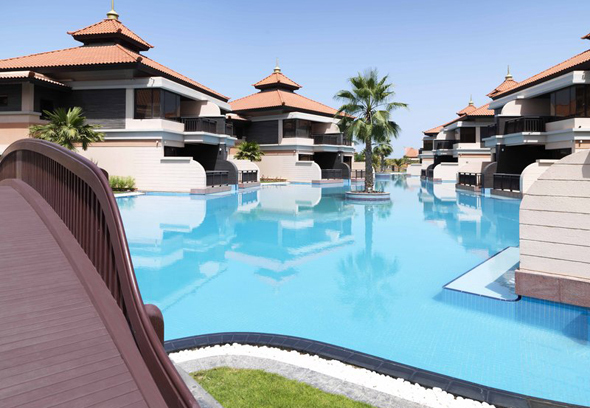 The expansive space comes complete with two pools, white sandy beach and range of sun beds, cabanas and private villas. As beach clubs go it’s not exactly in a central location, but worth the effort to get to and there’s always plenty of people on the weekend. The entrance price is a little cheaper if you just want pool access and a seat at the bar, with a food and drink voucher too. Perfect for: Heading out of Dubai for a day-cay. Price: Dhs99 for one adult and two children, under 4s free. 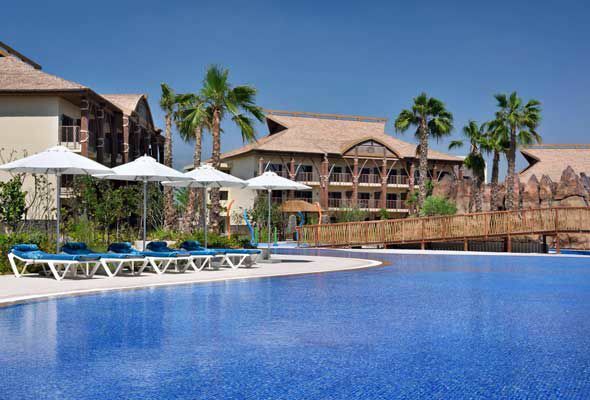 Lapita is a Polynesian-themed family resort set within Dubai Parks and Resorts on the outside of town. Perfect for a family day in the sun, it’s Dhs99 for one adult and two children under the age of 17. Add an extra Dhs49 for any additional child under 17 and Dhs99 for an additional adult. Under 4s are free. Perfect for: Sun-worshipping on your lunch break. Spend Dhs80 on a pool pass at this inner-city hotel and you can then use that Dhs80 towards food and drink. So yes, the pool pass can be effectively a free add-on to your lunch. Oh, and this is on offer seven days a week. Perfect for: Sun worshippers who like a little luxury. Price: Dhs275 weekdays (with a Dhs150 food and drink voucher), Dhs325 weekends (with a Dhs200 food and drink voucher). 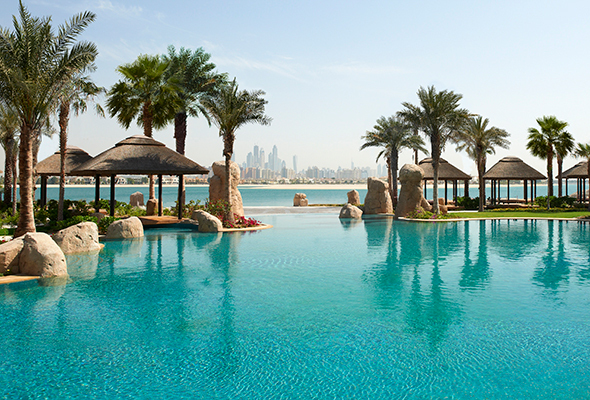 For Dhs275 through the week and Dhs325 on weekends, you can spend the day by Sofitel The Palm. The hotel offers an outdoor jacuzzi, a slide pool and seven outdoor pools to choose from for some serious tanning. Its Polynesian-inspired decor will have you feeling like you’ve headed to an island resort for the day while you soak up the sun. There’s limited space, so you’ll need to book at least 24 hours in advance, and groups must be limited to four people. Perfect for: When your mum’s visiting and you take a day off work. Price: Dhs200 on weekdays and Dhs250 on weekends. 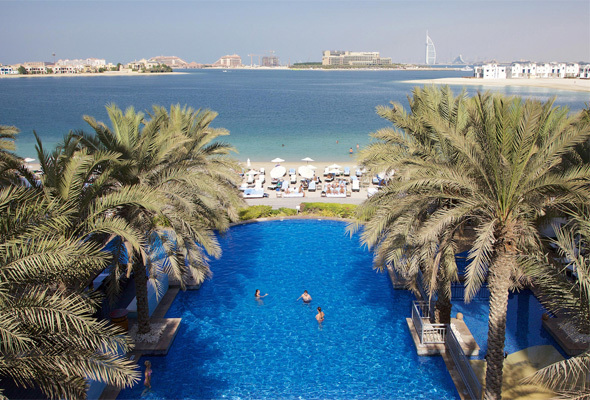 The pool at this hotel looks out over the Burj Lake, and its loungers are nicely spread out under the shade of palm trees. For Dhs200/Dhs250, you can spend the day at this pool, enjoy an oriental bathhouse, jacuzzi, and the steam room. Enjoy your pool day at this swanky hotel in Downtown Dubai for Dhs200 on weekdays and Dhs250 on weekends. The price is inclusive of pool access on the middle deck which is for adult-only, or the lower deck which is more family-friendly. There’s a uninterrupted view of Burj Khalifa – perfect for getting that Instagram shot! 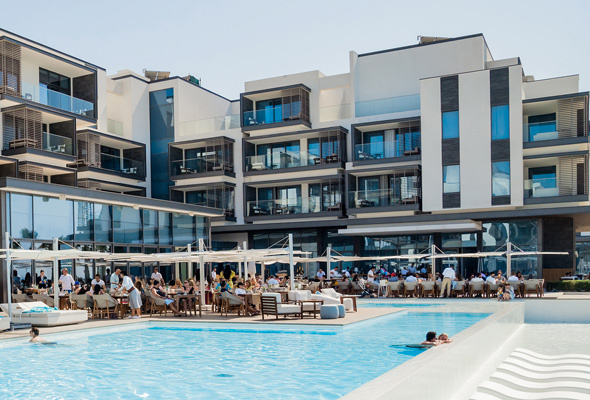 Perfect for: A more relaxed Nikki Beach experience. Price: Dhs200 weekdays, Dhs300 weekends. Want to soak up the sun? 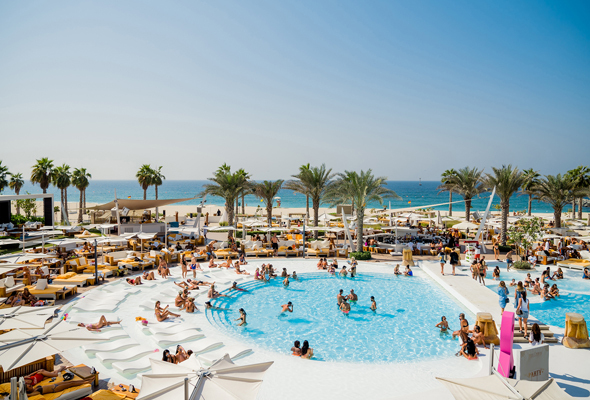 Nikki Beach Resort has a sprawling pool and loungers for guests and non-guests to do just that. It comes with a Dhs200 entry fee through the week, and Dhs300 on weekends. The vibe is much more chilled than its beach club neighbour but that’s exactly what makes it such a great place to relax for the day. Perfect for: Ultimate Dubai luxury. Price: Dhs1,800 for a luxury cabana package for two. When it comes to experiencing life poolside in the most luxurious fashion, the Burj Al Arab Terrace has to be one of the best in the world. A huge infinity pool juts out into the ocean surrounded on one side by plush day beds and over the bridge you’ll find another pool with a swim up bar. They have two cabana options available for external guests, a regular cabana for two or a royal cabana for four which comes complete with butler-inspired service, complimentary tea and coffee and a non alcoholic mini-bar. Perfect for: Boutique rooftop relaxation. Price: Dhs100 weekdays, Dhs150 weekends. With boutique luxury hitting you the moment you walk through the door, you can expect to be truly wowed when you head to the rooftop pool at La Ville. The infinity pool overlooks the Burj Khalifa and while it may be small, it makes for a peaceful paddle or some quiet relaxation on the handful of loungers that are smattered around. Be sure to stick around for sundowners at poolside bar Look Up. 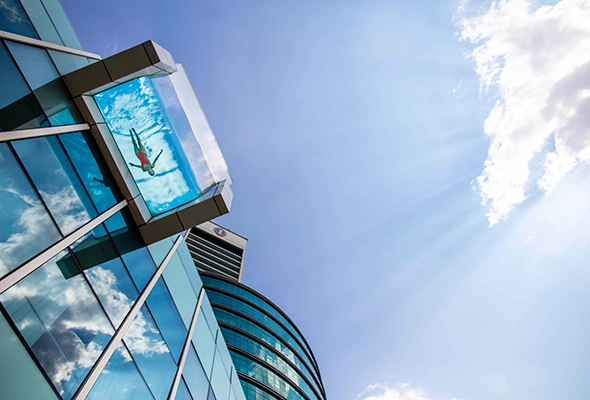 Perfect for: Swimming with great views. Price: Dhs200 weekdays (with a Dhs100 food and drink voucher), Dhs250 weekends (with a Dhs125 food and drink voucher). 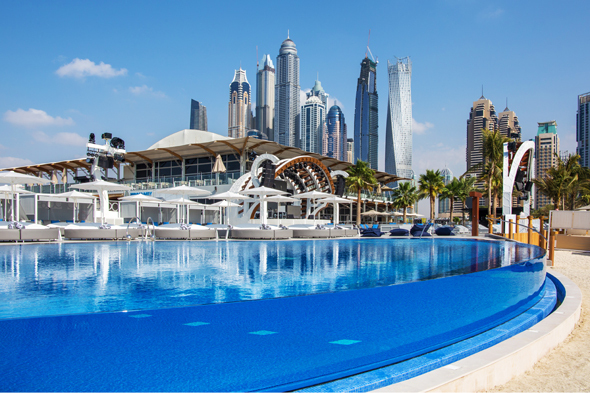 Located on the 4th floor of The Address Dubai Marina, Shades expands over a large terrace overlooking the Marina and comes with a huge infinity pool that’s perfect for a leisurely swim. Loungers are not reserved and are issued on a first come, first served basis. Price: Dhs200 minimum spend weekdays, Dhs250 minimum spend weekends. The pool at Andreea’s isn’t as big as some of its Marina neighbours, but it’s certainly one of the best looking. Head down early to bag one of the best loungers, or make a group booking and get comfy in one of the bigger cabanas towards the back. You get your entrance fee back to spend on food and drink, so it’s effectively free entry providing you purchase something. On Thursday and Saturday, ladies can enter for Dhs125, with selected drinks and a lunch selection included in the price from 12pm to 6pm. Price: Dhs200 on weekdays (with a Dhs100 food and drink voucher), Dhs250 on weekends (with a Dhs150 food and drink voucher). 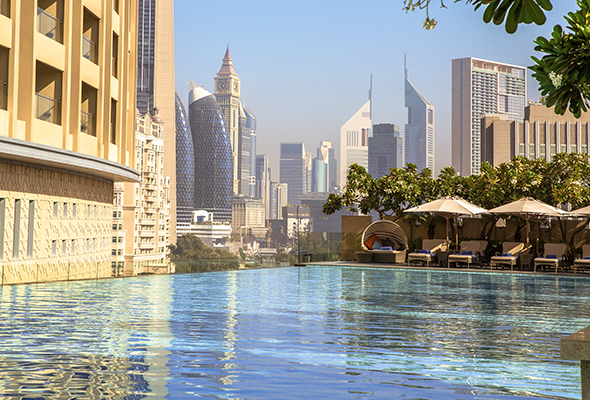 Spend a pool day in the midst of a concrete jungle at Address Dubai Mall. 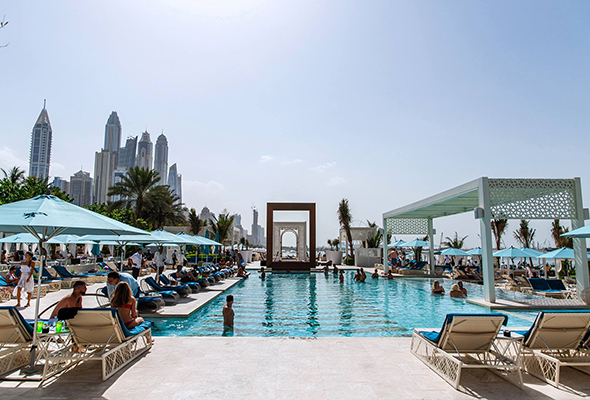 The lap pool is one of the largest in Downtown Dubai and is surrounded by sun beds and parasols to provide much needed shade as the Dubai summer hits. The food and drink voucher is redeemable at the Address Dubai Mall’s chic restaurant, Cabana, which serves up gourmet Mediterranean bites and refreshments.